Every operation is run differently and the attitude and demeanor or those handling the livestock varies. For some a "Bud box" is a very good fit, for others a tub is the only way to go. At HFC we believe that there are many systems and designs that fit both the low stress and safety bills. There is no doubt that a "Bud box", when used correctly, keeps the animals calm and gives them the attitude that they want to go down the alley. However there is also no doubt that a tub is safer for the operator. We have combined the two into what we are calling the "BUD TUB". With the tub gate open against a special stop, cattle enter the tub at the point nearest the dual alley. This gives the cattle the entire tub to turn around and come back to the alley - which is now the only opening to exit through. In almost every case we have witnessed, the cattle chose to flow down the alley side by side and the operator simply goes and gets another group of cattle from the feed alley to refill the "Bud tub". Anyone who has received very many cattle to be processed knows that there are always a few that jump off the truck with fire in their eyes and have no desire to be around the operators or the working facilities. Now the safety of the operators is more important than the calmness of the animal. When this animal enters the Bud tub, they will most likely circle around and around, snorting and everything but quietly walking down the alley. At this point the operator can simply go to the tub gate and push the animal down the alley as with any standard tub. 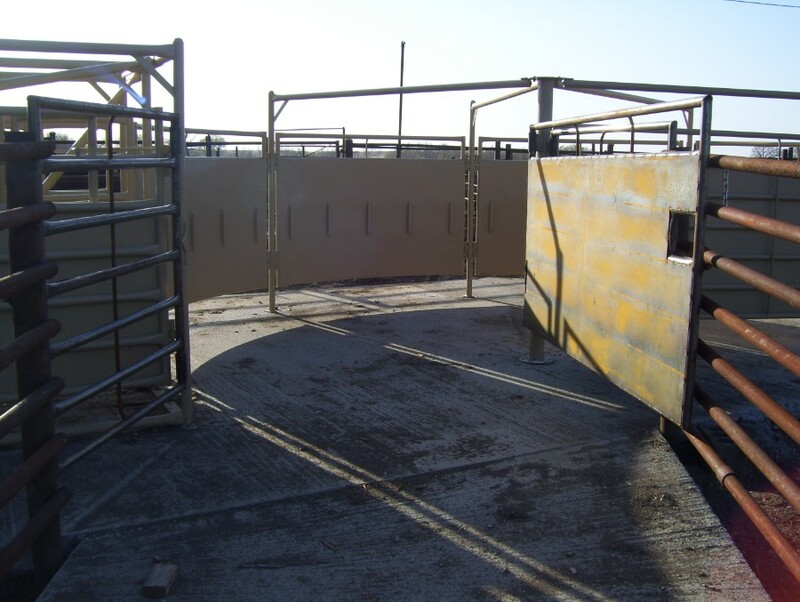 This is a perfect facility for feed yards that have many different operators with varying attitudes that wish to have lower stress on the cattle but cannot afford to give up the safety that is lost with a standard bud box. 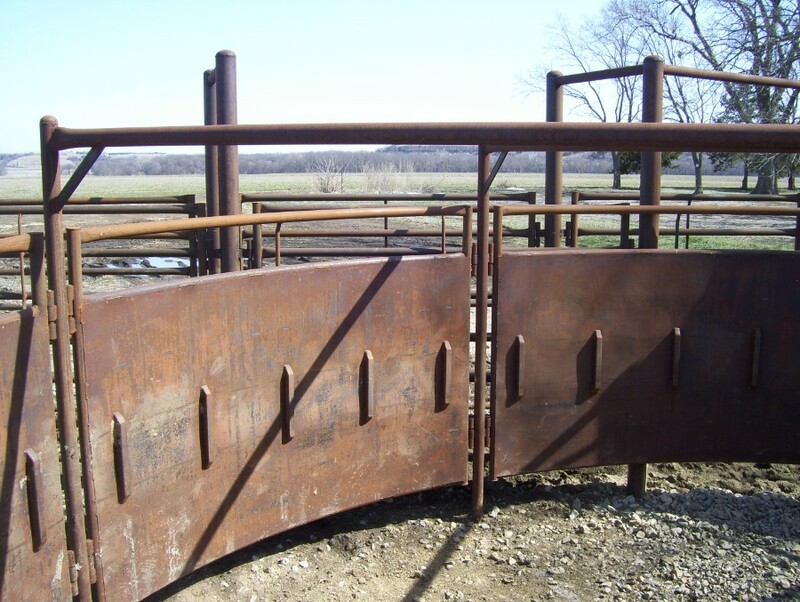 No matter what style of facility you are looking for, we are always available to look at your specific situation and help you come up with the perfect solution to your livestock handling needs! Tubs are a 10 foot in radius. Four sections makes 180 degrees, standard with powder coat finish. These units are designed to be anchored down to cement, or can be ordered with a bolt-on bottom frame for placement in soil. Our dual alleys are 15' of dual alley with a 5' transition to the single alley. This is the only dual alley on the market that does not have a wide spot in the transition. If both sides of the dual and the single alley are all set to the same width, that width is consistent for both sides when the animal moves through the switch gate. 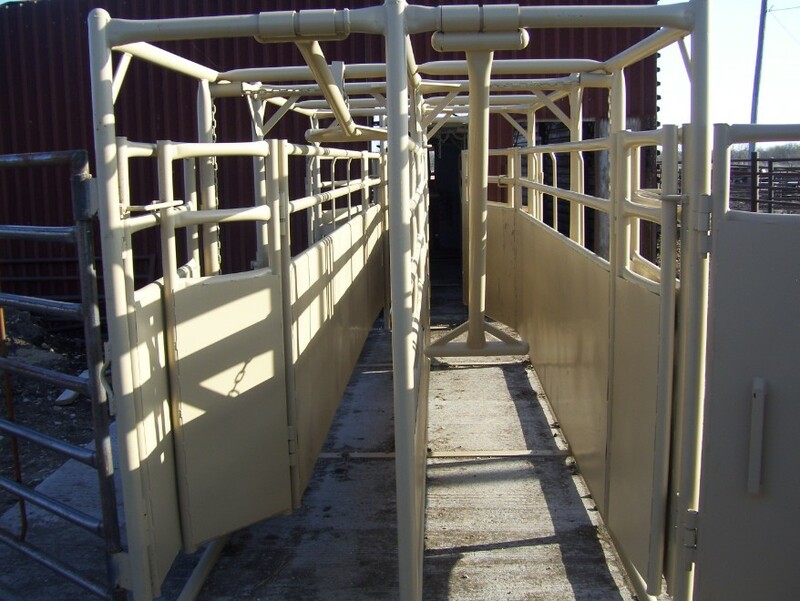 All of our livestock equipment is avalable at a discount without paint.